We will meet at 11:00am for a few minutes to make some valentines & have a little party/valentine exchange. 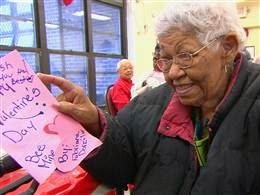 At 11:45am, we will deliver some Valentines in the dining room just before the residents eat lunch. There are 72 residents, and I hope that each family can bring/make 72 Valentines so that each resident will receive more than one. I will provide some blank Valentines that can be decorated with markers/crayons/stickers, etc. Please bring supplies to share if you are able. This event is hosted by Everest Academy but open to all homeschoolers. Please review the Everest Academy Participation Policy before attending any of our events.